Would My Name Be Included? List-Posting Day at school – anticipated by students and dreaded by parents. As hopeful eyes scan the paper taped hurriedly to the glass trophy case in the crowded hallway, I hold my breath. In a matter of minutes, one friend will leap out of the school building in a victory dance while another friend will cry tears of defeat, inconsolable because her name isn’t on the list. The volleyball team, cheerleading, or the school play, choosing one over another is the inevitable, heart-wrenching dilemma faced by coaches and teachers every year. Wouldn’t it be wonderful if we could all make the list? The above passage from chapter 14 is a word from the Lord given to Ezekiel to illustrate how important it is for us to keep God first in our lives. God wanted his statement told to the elders of Israel, so they would know not to have “idols in their hearts” (v.3). In other words, keeping God where He belongs, ahead of everything else, would surround them in His protection and blessing. 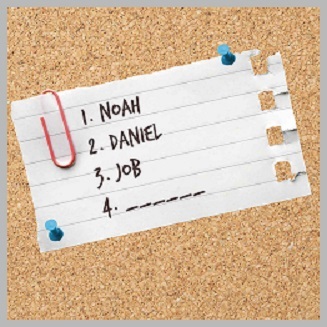 Interesting, though, how God points out Noah, Daniel, and Job – setting them apart from all others. From this statement we can conclude these men had a certain uniqueness that God wants us to recognize. “Even if these three men – Noah, Daniel, and Job - were in it…” (v.14). When faced with insurmountable challenges and unfathomable loss, these Godly heroes followed the greatest commandment of them all – they put God first. And when we put God first in our own lives, we have the assurance that we are on that list, too. Not a list giving accolades, or displaying us as more important than others, but the one carefully penned by God. Yes, we carry a unique sense of peace and gratitude in knowing we will never be left out when God is our leading Coach and Teacher. Joyfully linking up at the following uplifting sites: Intentional Tuesdays, RaRa Linkup, Women2Women Wednesday, LiveFree Thursday, Tell His Story, & DanceWithJesus Friday. Click the links to the right for more encouragement!